The Süssen Bypass in southern Germany is intended to relieve through traffic. An overpass was built as part of this project. Andreas Stark GmbH & Co. KG from Aalen was awarded the contract to build the overpass. The contractor decided to use NOEtop wall formwork manufactured by NOE-Schaltechnik, Süssen. It is rather unusual for a public construction project to begin three years before its originally scheduled date. However, this was what actually happened in Süssen, a town with approximately 10,000 inhabitants in the district of Göppingen. The groundbreaking ceremony was brought forward from an unspecified date in 2016 to July 25, 2013. Moreover, the construction works are an important capital project in terms of the trans-regional roads infrastructure because the network as a whole is enhanced by the linking of the B10 and B466 federal routes. 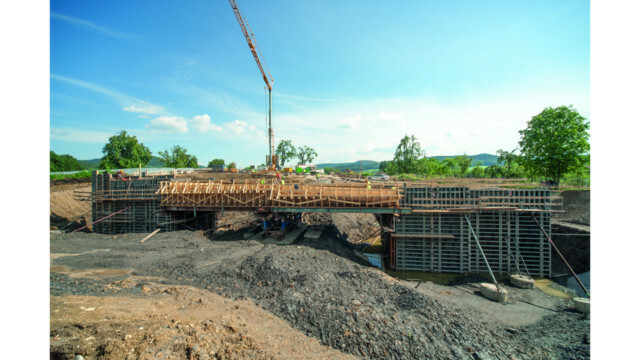 The new 1.3-mile bypass includes the construction of a 91-foot-long, 19-foot-wide bridge. This bridge takes a farm access track over the new B466. It was built by Andreas Stark GmbH & Co. KG from Aalen. 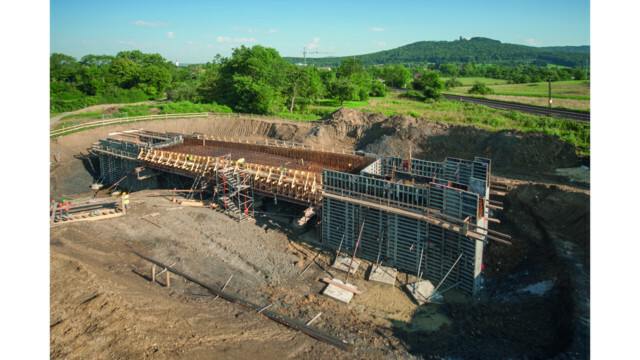 At Süssen, the contractor's task was to construct the foundations, abutment walls, carriageway deck, road surfacing and the parapet rails on the farm access bridge. The entire bridge had to be concreted in one pour to ensure the structure would act as a portal frame. This presented the contractor with several challenges. Since the volume of the abutments is quite large, there was a risk that the heat of hydration of the cement would produce temperatures of 113°F or more in the concrete, which could lead to it cracking. In addition, the bridge is built to a slight curve, which meant that the contractor's concreting gang had to work "uphill". Added to this is the asymmetry of the bridge, with one abutment being higher than the other, which makes concreting operations even more difficult. 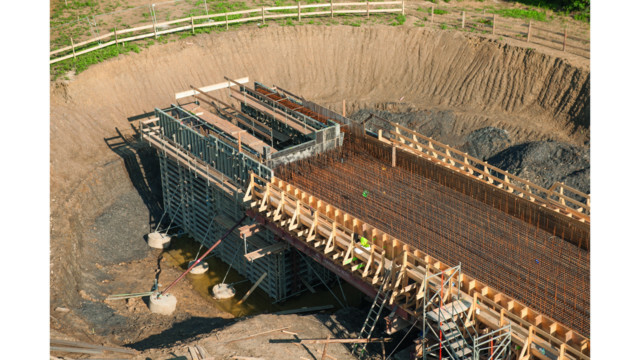 In order to avoid any risk, the Andreas Stark site team decided to use NOEtop manufactured by NOE-Schaltechnik for the bridge abutment and wing wall formwork. This formwork system is extremely durable and easy to assemble and erect. It is designed to withstand concrete pressures of 12.76 psi. The abutment formwork on the bridge at Süssen had to be angled in the bearing area. With conventional formwork, this would have entailed using appropriately shaped timbers, but thanks to NOEtop integrated bracing, the shape was achieved without the use of specially made elements. The integrated bracing is also the reason why the frame formwork can be used where necessary as "beam formwork". The manufacturer offers the formwork system in many different sizes to allow it to be used for a variety of applications. At Süssen, it meant the site team could form an area of over 151 square feet in one operation, without construction joints. "NOEtop made our work much easier — which was one crucial reason why we opted for NOE," said Giuseppe Maniscalco, the site foreman. "Another was something that the site team knew they could rely on: when the need arises, a NOE expert is always available and able to come up with a solution."